Rajasthan GK Question Sample Paper 7: Rajasthan General Knowledge Sample Question Paper No. 7 with Collection of Rajasthan GK Questions under GK Quiz in PDF @ Rajasthan GK Sample Papers. Q.1 Rashtriya Bal Swasthya Karyakram (RBSK) is launched in ? Q.2 Who is Current Governor of Rajasthan ? Q.4 Which of the following cities is the biggest producer of Cement in Rajasthan ? Q.5 Who among following was NOT Speaker of Rajasthan Assembly ? Q.6 In which district of Rajasthan large reserve of natural gas have been discovered ? 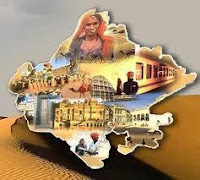 Q.7 Rajasthan is single largest producer in country of ? Q.8 What Fraction of Rajasthan’s land area is desert ? Q.9 Which NH goes from Punjab to gujrat through Rajasthan passing by Bikaner and Jaisalmer ? Tips: NH 15 passes through Pathankot, Amritsar, Tarn Taran Sahib, Zira, Kotkapura, Bhatinda, Ganganagar, Bikaner, Jaisalmer and Barmer. At Bikaner the National Highway 11 terminates on this Highway. Q.10 "BYTE" is associated with ? Q.11 World Bank Headquarter is situated at ? Q.12 WTO Headquarter is situated at ? Q.13 Australian Open 2013 Woman title winner is ? Q.14 Who is winner of 23rd Lal Bahadur Shashtri Hockey Tournament ? Q.15 Which bollywood actress awarded Bharat Muni Award 2012 ? Q.16 Which country in December 2012 got their First Woman President ? Q.17 Who is chairmen of 14th Finance Commission ? Q.18 11 ITU stands for ? Q.19 Who is new President of Japan ? Q.20 The Chief guest on 26th Jan. 2013 belong to country ? Q.21 Who is only player to score three triple century in First Class Cricket ? Q.22 "Kyoto Protocol-II" is related to ? Q.23 Surajkund Fair is held in ? Q.24 Rajasthan Explosives is situated at ? Q.25 The main seat of "Dadu Panth" is situated at ?